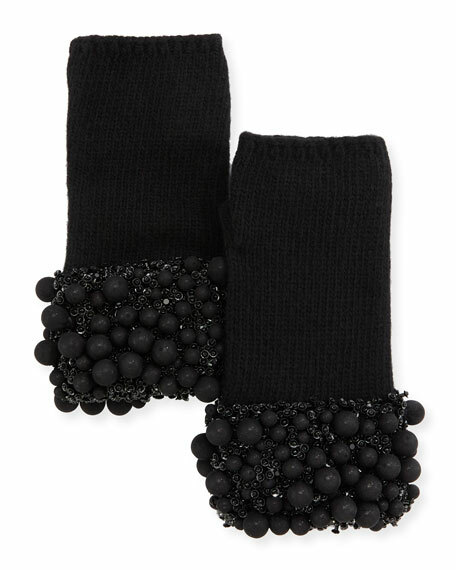 Carolyn Rowan fingerless gloves in cashmere. Cuffs embellished with Swarovski® crystals, sequins and balls. For in-store inquiries, use sku #2370283. Jocelyn fingerless gloves in dyed rabbit (China) fur. Approx. 4"L x 6.5"W. Open top, thumbhole. Backing, acrylic. Professional fur clean. Imported. Portolano tech gloves in cashmere, feature conductive threading in the fingertips to allow full usage of touch-screen devices such as smart phones and ATMs. Ribbed detailing at cuffs. Approx. 10"L. Imported.